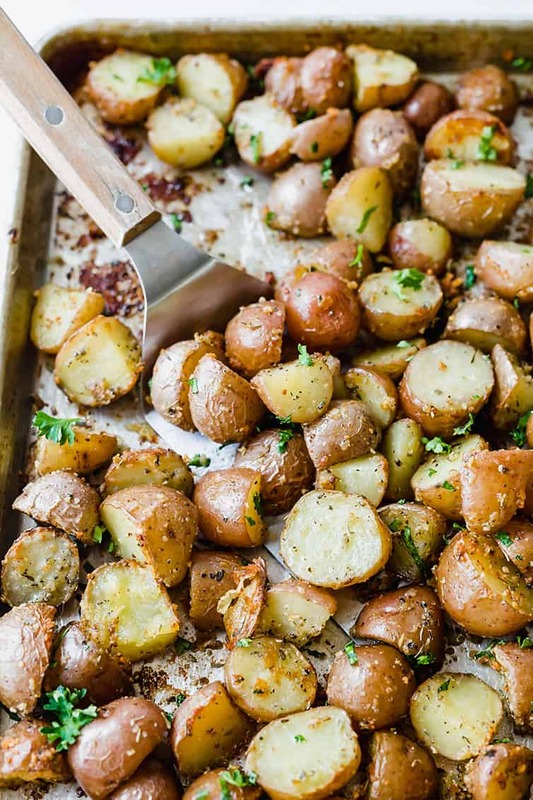 These are the BEST roasted red potatoes! 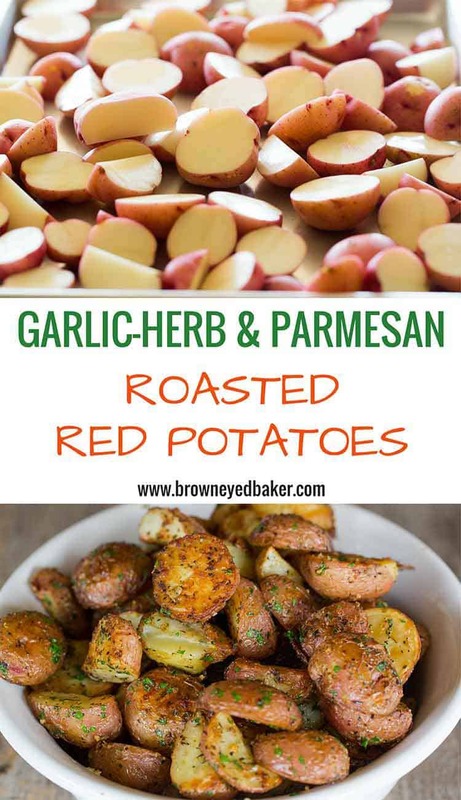 Full of flavor from the garlic and herbs, and the Parmesan cheese forms a crust on the potatoes… Delicious! One of the cornerstones of Sunday dinners at my grandma’s house were her famous roasted potatoes. Famous to us, and anyone else who had the opportunity to taste them, of course. 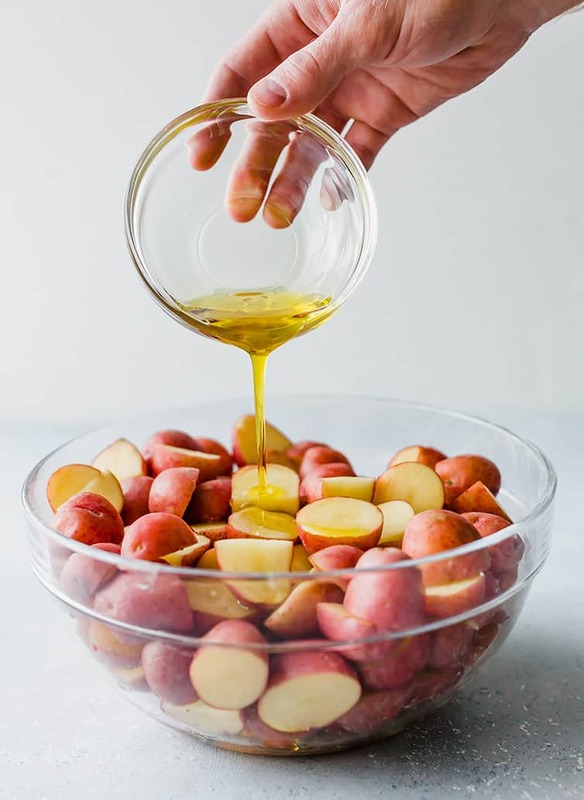 Everyone clamored for them, my uncle would hoard the bowl, and it would never fail that after my grandma pulled a baking sheet out of the oven full of potatoes, she would be sitting in the kitchen peeling another few pounds for a fresh batch. Pretty much every member of my family is a bottomless pit when it comes to roasted potatoes… she ruined us! I shared my grandma’s roasted potato recipe a couple of years ago, but the problem is that no one else in my family is able to cut the potatoes the way my grandma used to (a very rustic, hap-hazard cutting job!) except for my sister. 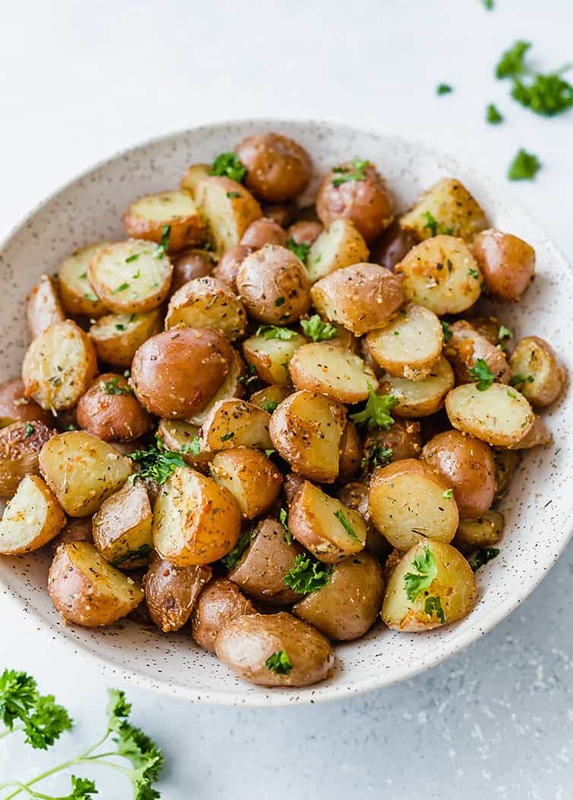 Roasted potatoes were a MUST for our newly revived Sunday dinners, but I needed a recipe for the weeks when my sister couldn’t get here early enough to cut the potatoes… my grandma’s potatoes are just NOT the same when they’re not cut the way she used to cut them. I’ve been making this recipe for at least a month and a half now, and everyone absolutely loves them. They still get gobbled up (and my uncle still hoards the bowl), even if they aren’t quite my grandma’s potatoes. There is a ton of flavor from all of the garlic and herbs, and the Parmesan sort of crusts over the potatoes, which tastes amazing. I let them get really brown and crisp before I pull them out of the oven… Perfection! I still want my grandma’s potatoes every single Sunday, but these are an incredibly worthy stand-in! Not good idea to toss the parmesan on potatoes before baking, It burns and then ruins the taste of all the potatoes. Better to sprinkle the cheese over at the end or close to the end. I thought about this before baking but did it anyway and it was a mistake. Hi Muriel, I’m sorry to hear this didn’t work for you. I’ve made these dozens of times and I’ve never had the Parmesan burn. Awesome! The family loved it! These were amazing!!! My husband isn’t usually a big potato fan. But he immediately said, ‘Wow, these are really good.’ We both went back for seconds. I did cut mine up a little smaller than the recipe calls for, so they cooked for a little less time. Otherwise, I followed the recipe. I will definitely be making again. Thanks for a great recipe!! Ever considered a small, tabletop oven? Here’s a good reason for one! My mom keeps hers on the covered back porch, so we are able and bake things like this all year! Thank you for sharing . I’m starting on this recipe right now! Does the garlic burn at such a high temperature for so long in the oven? Hi Rick, I’ve never had that happen, you should be good! Hello, I need to know whether I can make them ahead, let’s say the day before and give a quick reheating in the oven? Hi Silvia, This is a recipe that I think is best enjoyed fresh from the oven, but you can reheat them in the oven the next day. I have not tried freezing them and do not know how well they would thaw/reheat. Amazing dish! Best potatoes! So sweet and candied! Good idea to cut them jagged! This recipe was fantastic,very flavorful. They took no time at all to prepare, I’ve been looking for awhile for a great red potato recipe, now my search is over. I’m sure your grandmother would be thrilled that so many people are enjoying her recipe. Thanks for sharing!! 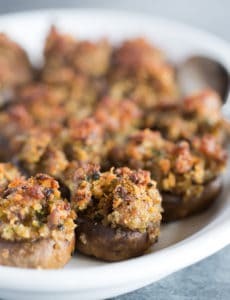 My husband made these for supper last night to go with meatloaf. We loved the potatoes so much he is making another batch as I type, for tonight’s supper. The seasonings blend well together and the potatoes were done to perfection. This was amazing! I followed all the directions except since I had 4 lbs rather than 3, I added a bit extra oil and parmesean. My boyfriend and I absolutely loved these. They were even delicious cold in the refrigerator! I ate them right out of the tubberware, so I don’t know what they taste like reheated. Thanks for a great recipe!!! These were easy and delicious. All I had was grated Parmesan in the can, garlic, salt and pepper, and oil. They came out perfectly! I also used a mix of new potatoes and red potatoes and all were perfect. I cut them a bit smaller to speed cook time. We have made these potatoes a dozen times now and they are always a favorite. 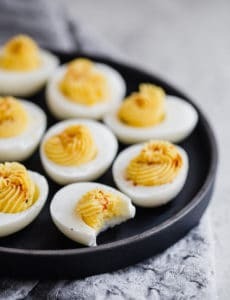 I even like them at room temperature so I’ll cook them up in the morning for breakfast and we’ll snack on the leftovers for the rest of the day. The Parmesan cheese adds just the right balance to all the spices. Thank you!! 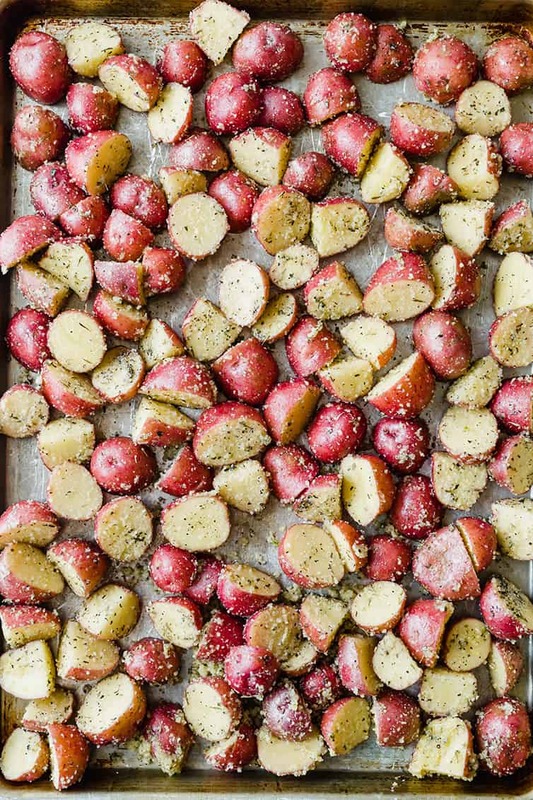 We love these potatoes…so yummy! 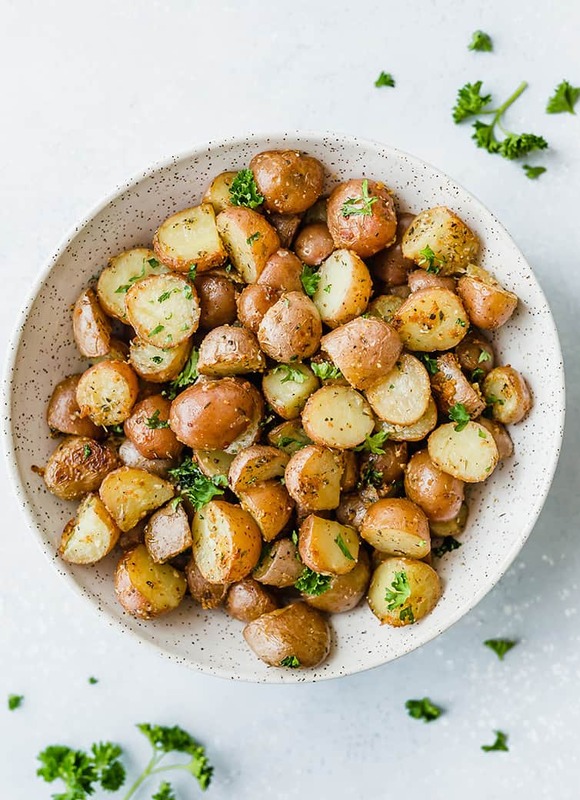 I’m going to make fries today but I think this roasted potatoes will be a better dish to try. Thank you for sharing the recipe! Want to make these on the grill in foil…have you ever tried and how long would you cook? Thanks so much! Hi Tonia, I’ve never done these on the grill, so I’m not sure! Very good and easy to make! Loved it and so did my husband. I did reduce ingredients amounts to fit only 2-4 people. and that is why I look at new recipes every day! Even simple recipes can be improved. The seasonings are perfect. I added a large onion- so good! Thanks for sharing delicious recipes and your beautiful family. would you make a picture of your sister’s cut up potatoes (like your grandma cut them up)? Please. My grandmother has been gone for almost 35 years and I still miss her. No one made coconut cake like her. You speak so lovingly of your grandma and your sister’s ability to cut roasted potatoes just like grandma did and so we need a picture, lol. I will try to get one the next time she makes them at my house! These smelled stand looked delicious while in the oven. But then when I went to turn over potatoes, realized they were sticking to the foil along with all the goodness that coated them. What do you recommend lining baking pan with to avoid this? Hi Sara, You shouldn’t line the baking sheet with anything at all; just follow the directions to lightly grease the baking sheet (I prefer oil). Made these potatoes with pork tenderloins for Christmas dinner. My family loved them! Thank you for a delicious recipe! Very delicious! I had some red potatoes left over from making soup the other day and googled ‘roasted red potatoes’ to see what I could make. These turned out amazing and my son was in love. Definitely something to keep in my wheelhouse from now on. If I have to triple the recipe for Christmas Eve dinner, how would that alter the baking time? Hi Colleen, If you triple the recipe, you won’t be able to fit it all on one sheet; I would recommend dividing it between three baking sheets and keeping the same baking time. Leftovers make awesome breakfast potatoes! Just brown on all sides a little more in a skillet! This is an easy and very tasty recipe. I think the Parmesan cheese gives it an added kick but doesn’t overpower the flavor! I made these yesterday for my brother and husband for Veteran’s Day, they are both Vietnam vets. They didn’t feel like going out to dinner. Everything else I made with the potatoes went unnoticed, they raved about these. Came out crispy and full of flavor. I think I will cut into bigger chunks next time, more like the picture. They are absolutely delicious. Thank you. Your grandma’s recipe is amazing. Simple to prepare and as delicious as you said. Two recommendations for others trying this recipe (and really, what are you waiting for?) First, the Parmesan brings in a lot of salt, so I used half a teaspoon, not 1 1/2 tsp called for, and it was plenty salty for my taste. Second, do not shrink from adding the full amount of pepper. I almost wimped out but added the full teaspoon and discovered that’s what gives these potatoes their zing. The parmesan cheese stuck to the bottom of the pan only 30 minutes in. Maybe add parmesan at the end with the butter.